NASA astronauts living on the International Space Station are getting their taste buds ready for the first taste of food that’s grown, harvested and eaten in space. Cultivating the ability for crews to grow their own food is a critical step on the path to Mars. Turn to NASA TV on Monday, Aug. 10 for the Veggie harvest — and a first taste of history. The six astronauts currently living on the International Space Station (ISS) have become the first people to eat food grown in space. The fresh red romaine lettuce that accompanied the crew’s usual freeze-dried fare, however, is far from the first crop grown on a space station. For decades, NASA and other agencies have experimented with plants in space, but the results were always sent to Earth for examination, rather than eaten. A number of technologies NASA has explored for these space-farming experiments also have returned to Earth over the years and found their way onto the market. Orbital Technologies (ORBITEC), for example, partnered with Kennedy Space Center to develop the plant growth system—known as Veggie—that produced this most recent crop of lettuce, as well as its predecessor, the Biomass Production System. Many features of the high-efficiency lighting system the company developed with Kennedy funding have been incorporated into ORBITEC’s commercial offerings. Not only does its greenhouse lighting technology take advantage of the efficiency of LEDs, which waste almost no energy on heat, but its variable light output allows it to be adapted to specific plant species at specific growth stages. It can also sense the presence of plant tissue and only power nearby LEDs. Overall, it uses about 60 percent less energy than traditional plant lighting systems. 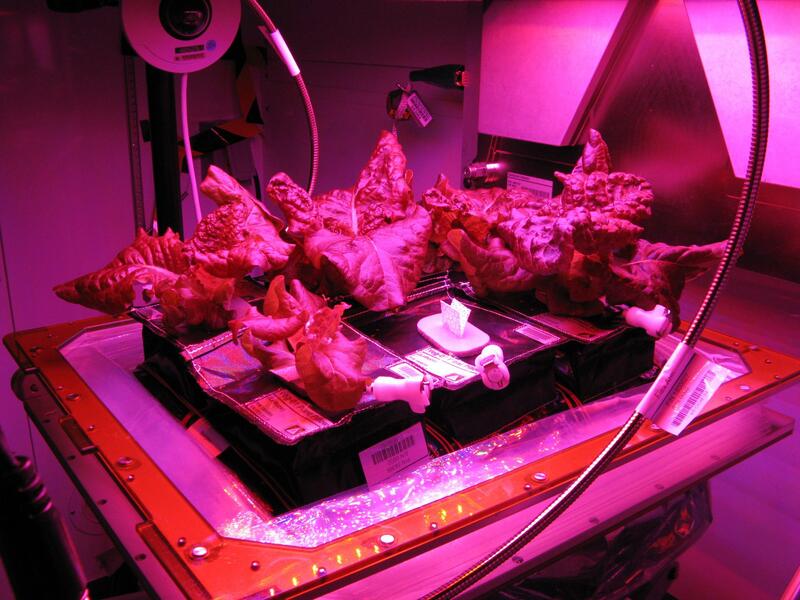 Orbital Technologies partnered with Kennedy Space Center to create a plant growth system known as Veggie, now used on the International Space Station. The system employs LEDs, which are highly efficient and long-lasting and radiate hardly any heat. 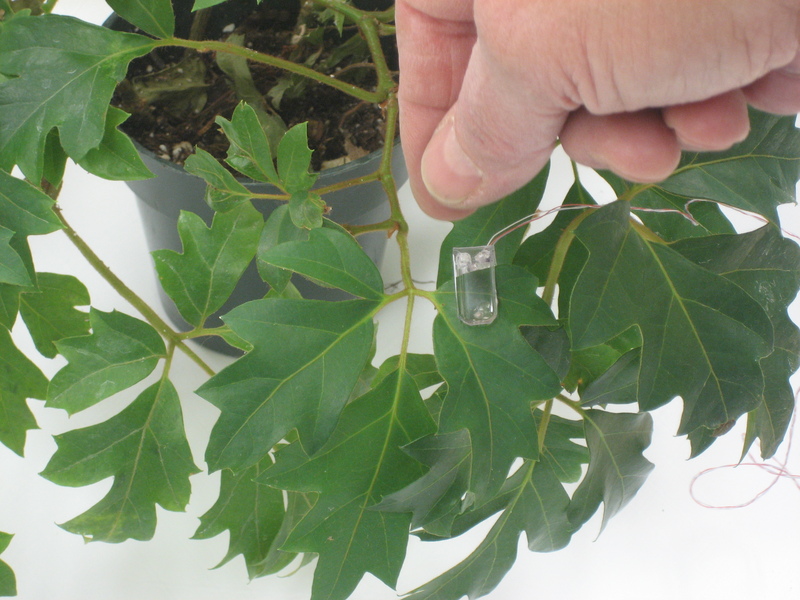 While early LEDs came to NASA’s attention as a potential light source for plant growth, the National Space Biomedical Research Program (NSBRI), a NASA-funded group of institutions, took notice of the fact that the lamps could produce specific wavelengths of light. The team that was growing plants at Kennedy built LED prototypes for an NSBRI team that used it for a research project, discovering that different wavelengths of light helped test subjects stay awake or fall asleep. So the Kennedy team partnered with a contractor to develop the ISS’s first LED lighting system. Soon after, several scientists involved in the project brought their expertise to the company Lighting Science, which developed a line of DefinityDigital light bulbs for home use. Different bulbs can suppress or increase melatonin production in the brain to induce wakefulness or sleepiness, respectively. Another is used to grow plants, and a fourth bulb is designed for outdoor lighting in coastal areas, where it won’t disorient sea turtles, as normal outdoor lighting tends to. A problem faced by greenhouses both in space and on Earth is ethylene, a gas plants give off that hastens the ripening of fruits and vegetables. Accelerating ripening means speeding decay. Researchers at the Wisconsin Center for Space Automation and Robotics, a NASA research partnership center at the University of Wisconsin in Madison, figured out how to deal with this problem in the 1990s, ultimately leading to a highly successful line of products. The ethylene-scrubbing technology they devised first flew in 1995 on the space shuttle and was later licensed by KES Science & Technology, which partnered with Akida Holdings to launch the AiroCide product line. The scrubbers turned out to destroy not only ethylene and other volatile organic compounds but also airborne bacteria, mold, fungi, mycotoxins, viruses, and odors. AiroCide scrubbers are now widely used for food preservation in supermarkets, produce distribution facilities, food processing plants, wineries, distilleries, restaurants, and large floral shops. They’ve been incorporated into a line of refrigerators. They’re also used in parts of the developing world such as India and the Persian Gulf area, where food storage and distribution is often complicated by harsh conditions and underdeveloped infrastructure. AiroCide units are also commonly used to clean the air and prevent the spread of disease in hospitals, doctors’ offices, laboratories, schools, hospitals, and daycare centers. By 2013, a home version became available and immediately caught on. Another product of NASA’s space-farming endeavors allows plants to text their caretakers when they’re thirsty. Astronauts aboard the ISS don’t have a lot of time for checking up on plants, so an employee of BioServe Space Technologies, a nonprofit, NASA-sponsored research partnership center, built a sensor that used electrical impulses to measure leaf thickness, which indicates water content. BioServe partnered with AgriHouse Brands Ltd. to test the sensor and found that it not only eliminated guesswork from watering plants but also reduced water use by 25 to 45 percent. By 2012, AgriHouse offered sensors that attach to plants and transmit water-content data to a user’s computer, and the system can send text messages when certain crops need water. This wasn’t the first partnership between BioServe and AgriHouse to advance agriculture in space and on Earth. In the late 1980s, AgriHouse used BioServe research to develop a method for aeroponic crop production—that is, growing plants suspended in air without soil or media. Plants grown aeroponically require far less water and fertilizer, don’t need pesticide, are much less prone to disease, and grow up to three times faster than plants grown in soil. For a 2007 aeroponic experiment aboard the ISS, BioServe consulted with AeroGrow International, which had been inspired by NASA’s aeroponic work, to develop its AeroGarden kitchen gardening appliances. The experiment using AeroGrow technology proved a success, as has the company’s line of indoor gardening systems, which easily grow food and other plants without dirt, weeds, or the need for a green thumb. NASA’s push into the frontiers of space will undoubtedly continue to advance the state of the art of one of mankind’s oldest endeavors. As the agency eyes deep-space missions like a trip to an asteroid or Mars, space farming becomes less of a novelty and more of a necessity. Plants will be an integral part of any life-support system for extended missions, providing food and oxygen and processing waste. Significant further advances will be necessary, and each of them promises to bring new innovations to agriculture here on Earth.